White Ash. Fraxinus americana L.
Fraxinus alba Marsh. ; F. acuminata Lam. Ash, American white ash, cane ash. This tree usually attains a height of from 60 to 80 feet, but occasionally reaches 120 feet. The leaves, which appear late in the spring, are about 12 inches long and consist of from five to nine leaflets from 3 to 5 inches long and about half as wide. The small, whitish-green flowers which appear from April to June are arranged in loose clusters, and the fruits which follow are in the form of clustered, winged seeds each of which is from 1 to 3 inches long, narrow, flat, and 1-seeded. 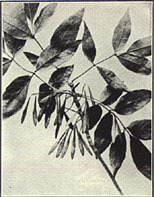 The black ash (Fraxinus nigra Marsh., syn. F. sambucifolia Lam.) is also a native, inhabiting swamps and wet woods from Canada to Virginia and Arkansas. Other names applied to it are hoop ash, swamp ash, water ash and basket ash. It reaches a maximum height of 100 feet and has leaves about 16 inches long composed of 7 to 11 leaflets 3 to 6 inches long. The bark of the trunk and root of both species. prev: Wahoo. Euonymus atropurpureus Jacq. next: White Mustard. Brassica alba (L.) Boiss.